With week one of the college football season in the books, there are a few conference-wide trends: the Big East looks bad, the ACC looks worse, and the jury is still out on how the Big Ten is going to look at the top. Illinois lost to a simply better Missouri team, which wasn’t a surprise, but at least hung in well enough to justify the Illini staying in the top 25 in both polls, which was personally a pleasant surprise (and in the end, fair considering that Illinois was playing a team over 10 spots ahead of them in the polls going into the game). 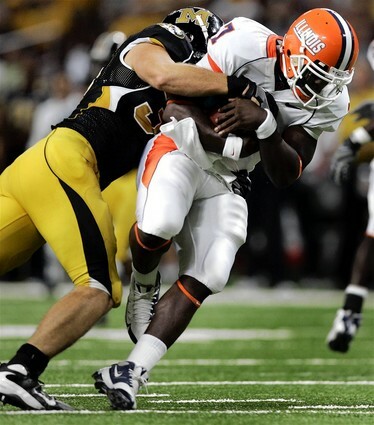 The two main concerns coming out of the game for Illinois were the horrendous lack of tackling, which resulted in roughly 8,000 YAC for Mizzou (and Chase Daniel shred the defense overall) and the completely dead running game in the wake of the loss of Rashard Mendenhall to the NFL. At least the running situation was mitigated by the fact that Juice Williams had a banner day stats-wise and nailed more accurate passes than ever before. Mizzou practically stacked eight guys in the box the entire game to take away the Illini running “attack”, which allowed Juice to find some mind-boggling wide-open receivers downfield on a number of occasions. Hopefully, the fact that Juice burned a pretty solid Missouri defense with his arm will make future opponents think twice in terms of stacking the line, which would open back up the Illini running game. There really isn’t an excuse for the sloppy tackling, though. The one bright spot on defense was the coverage ability of Vontae Davis – if he continues playing like he did this past week, he’s going to be taken very high in the first round by an NFL team in the near future. (1) Miami (+21 1/2) over FLORIDA – When the marquee game of the weekend features a 21 1/2 point spread, that means it’s a pretty bad football Saturday. (It will all be made up next week, though, with Ohio State – USC.) I know that the Hurricanes were brutal last season, they have a bunch of freshmen playing, and Tim Tebow has a Zen-like hold on Erin Andrews. However, have the mighty Canes fallen so far that they would be over three touchdown underdogs to the Gators in the revival of a once-heated rivalry? I think not – I’m taking Miami with the points. (2) CENTRAL FLORIDA (+14) over South Florida – Staying in the Sunshine State, I’m selling off USF stock after a couple of seasons of outsized returns. This is one of those games that means a whole lot more to UCF (who believes they were just as worthy of a Big East invitation as USF) and it’s on their home field, so I’m taking the points again. (3) EAST CAROLINA (+8) over West Virginia – Here’s a true home game for East Carolina against a top ten team one week after upsetting Virginia Tech in Charlotte. At the same time, one of the few items that I have been consistently correct on through the years is knowing that West Virginia finds a way to stumble every season even though there is always a contingent of pundits that believes the Mountaineers will back into the national championship game since they always have a schedule where they could theoretically run the table on paper. I’m not calling a straight-up upset here for ECU (and I’m sure WVU is on notice after VT stumbled last weekend), but it looks like I’m taking the points across the board on this week’s parlay. The NFL parlay picks come tomorrow.